Cammax Limited were approached by Tickets.com to provide their client with a pre-booked self service ticket collection kiosk. Tickets.com wanted to provide the kiosk for The Watershed, who are a busy media centre in the heart of Bristol that promotes creativity, innovation and talent. Customers can either call the centre by phone, or book their tickets online, and then simply collect the pre-booked tickets upon arrival, at the self service kiosk with clear step-by-step instructions. Thus the customer can avoid waiting in a queue to purchase tickets, and more tickets can be sold by the Watershed within any given time window. The kiosk was designed specifically for the location. The Watershed occupy a listed building, and it was very important that any machine installed did not in any way impinge upon the structure, or the aesthetics, of the building’s magnificent listed architecture. Therefore the Cammax design and engineering team faced the challenge of complete redesign of the internal component layout, so that the kiosk’s depth was reduced to allow for surface mounting. 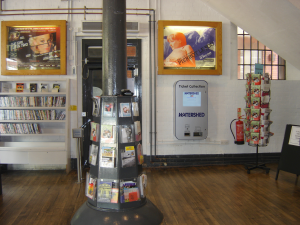 The kiosk was installed in April 2009 and has proven to be a massive success with both The Watershed and customers that use it.